Our Alpine School Arco was born in the year 1996. 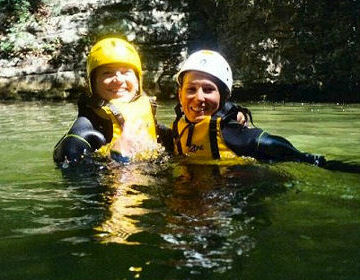 At that time many people offered guiding on canyoning trips without the possession of any professional qualification, training, nor insurance. Nowadays professional guidance in the canyons is exclusively reserved to the alpine mountain guides by law. This is prudent because in the canyons the same techniques and rope maneuvers which are typical for mountaineering activities are also being applied in the canyoning trips. Unfortunately, the phenomenon of abusive guidance on canyon trips has not completely been eliminated. Make sure that the person who accompanies you on your trips is an internationally licensed mountain guide registered with UIAGM and third party liability insurance ! The Sarca Valley in the region of Trentino came into existence in the glacial period. During the centuries the brooks have hollowed deep canyons. In this untamed mountain world of Dolomites Alps the sun is passing through the rocks and playing with the crystal clear waterfalls. The mountain guides Arco are always at your disposal. Our neopren wetsuits prevent you from feeling the cold and make you experience a unique adventure. For the participation in canyoneering there is no special physical condition required. It is not even necessary to know how to swim, however, the participants should be "familiar" with water in order to enjoy and have fun. In the area of Lake Garda there are several canyons of each difficulty degree (beginner to experienced). We would like to underline that canyoning consists in the descent (not ascent) of canyons/torrents/waterfalls by means of "abseiling" (belayed on the rope of the mountain guide), sliding and/or jumping (optional). It is an activity with fun for all participants who want to discover an unknown and incontaminated world. The entire tour has a duration of ca. four hours (also for the beginners); in order to enjoy more, we do not advice the half-day trips which have a much shorter duration. WHO are your guides ? Nowadays there are many agencies and clubs which are offering tours in the canyons. We would like to point out that - BY LAW - only licensed Mountain Guides UIAGM are permitted to accompany and guide guests. We strongly recommend to choose only Mountain Guides for your tour. What the participants should bring along for the trips: dry clothes to change, bathing costume, towel, trekking shoes or sneakers, an extra pair of shoes to change. We recommend to leave all valuables and/or what should not get wet in your hotel. This is the equipment which our guides will provide for the canyoning trip: neopren suits (long sleeves/long legs, similar as diving suit), neopren socks, helmet, harness, life-jacket, rope, carabiners. The rental of the gear is free of charge. We would like to point out that the participants are wearing their own trekking shoes during the trip and therefore will get soaked. Therefore it is a MUST to bring along an extra pair of dry shoes to change. Most of our canyons are located along the Western coast of the Lake. If our guests are staying in hotels in the area of Riva del Garda, Torbole, Nago etc., we are offering a free pick-up service with our mini-bus to and from the hotel. Otherwise we agree upon a meeting point which can be reached easily. Our staff in the Alpine climbing school in Arco consists of nationally and internationally licensed mountain guides who are registered with the national and international Mountain Guides Association (UIAGM). They are in the possession of a valid third party liability insurance.